The cold front that passed through the forecast area yesterday afternoon and overnight has decreased air temperatures significantly across the forecast area this morning. Remote sensors are reporting air temperatures below freezing at all locations within the forecast area. Air temperatures above 8,000' are in the teens and single digits. Strong southwest ridgetop winds that occurred yesterday are decreasing this morning, but are expected to remain moderate in speed through today. Yesterday, the very weak surface refreeze that was created by radiational cooling melted very quickly. Observations made on Mt. Tallac (Desolation Wilderness area) revealed that once the thin surface crust had melted on E-SE-S aspects, 1 to 2 feet of wet snow that had formed over the past two days was exposed at the surface at all elevations. Despite significant wet snow forming each of the past three days, no significant avalanches beyond small human triggered surface sluffs were observed or reported during the recent warm spell. A solid refreeze of wet surface snow is expected to have occurred overnight. Today, cold air temperatures will continue the process of wet snow refreeze in many areas. Some minor melting of surface snow will occur on SE-S-SW aspects, mainly below 8,000'. The snow surface in most other areas is expected to remain frozen today. Natural and human triggered avalanches are unlikely at this time. Max. 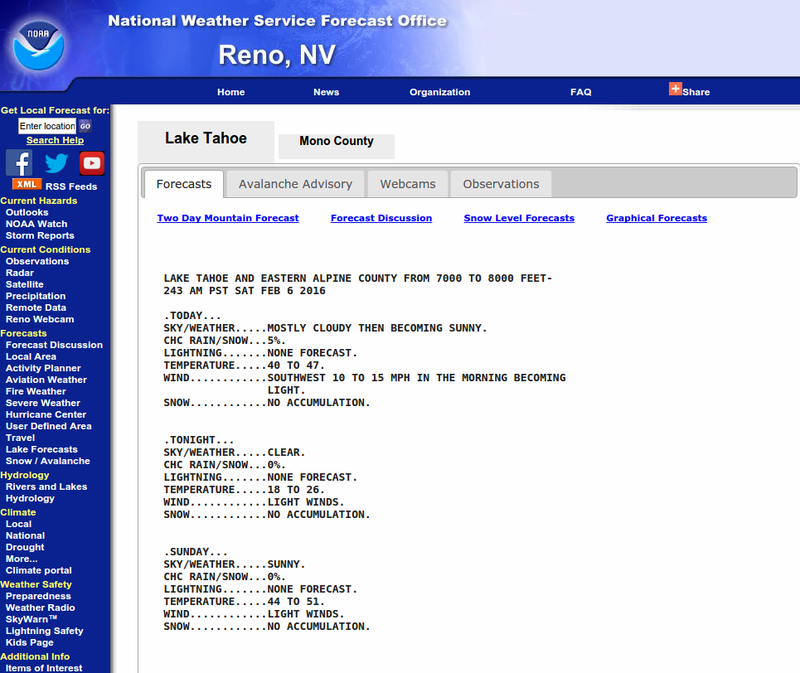 temperature at Sierra Crest past 24 hours: 36 to 43 deg. F.
Ridgetop winds forecast for the Sierra Crest: Southwest at 20 to 25 mph with gusts to 50 mph. Winds decreasing to 15 to 20 mph with gusts to 40 mph in the afternoon. Today, partly cloudy skies with daytime highs 28 to 36 deg. F. West winds at 10 to 20 mph with gusts to 35 mph. Winds shifting to northwest by late morning. Tonight, partly cloudy skies in the evening, then clearing. Overnight lows 18 to 24 deg. F. North winds at 10 to 15 mph with gusts to 25 mph in the evening. For Wednesday, sunny skies with daytime highs 41 to 48 deg. F. Northeast winds at 10 to 15 mph. Today, partly cloudy skies with daytime highs 22 to 27 deg. F. Southwest winds at 20 to 25 mph with gusts to 50 mph. Winds decreasing to 15 to 20 mph with gusts to 40 mph in the afternoon. Tonight, partly cloudy skies in the evening, then clearing. Overnight lows 20 to 25 deg. F. North winds at 15 to 20 mph with gusts to 40 mph. Winds shifting to northeast at 10 to 20 mph with gusts to 35 mph after midnight. For Wednesday, sunny skies with daytime highs 35 to 41 deg. F. Northeast winds at 15 to 25 mph.